In the fall of 2017 I found myself with some extra time on my hands and the whitewater runs to have been overly charged. I needed additional exercise in my life that included cardio, as in whitewater kayaking you distinctly avoided being tapped out on air as at any given moment you may need to be underwater for a (hopefully) short stint. I also used to mountain bike back in the day, and then spent a lot of time doing motocross. I picked up a dated but current enough full suspension bike for at first and rode some easy trails. That was fun. I got the bug though and started to wait something better. Plus, some incentive to spend money came up, so I went big and treated myself to a nice high end last years model carbon fiber bike. It had all the goods on it, and I dug it. Unfortunately, finances resulted in me needing to sell it to reprioritize other aspects in my life, along with it just didn't scratch that DIY itch that's a big deal for me. Fast forward a few months later, and that itch was still here. 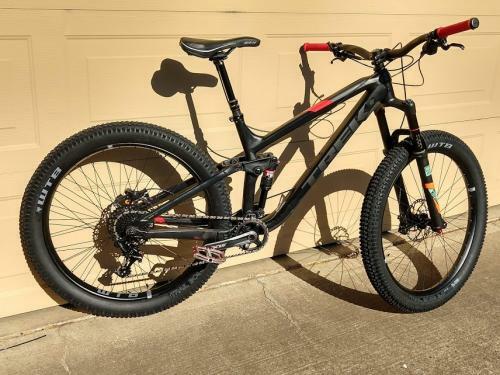 I randomly cruised ebay after lamenting about how overpriced bike frames were, and then found myself a screaming deal on a 2017 Trek Fuel EX 8 frame. $500 shipped. Being the nerd that I am I broke out a spreadsheet and quickly calculated if building the bike out was still viable. Wheels, forks, tires... al the costs trickled in and for the first time on a frame off build, I saw that the cost of parts was below the going sale value of the bike on Craigslist. It was finally a smart move. I also on review could take some of the things i learned from my expensive bike and build this one out to be quite to my liking. I've had the bike a bit now. I'm hooked. I'll be documenting everything about the ongoing build, maintenance, overhauling, and shredding done on this bike.